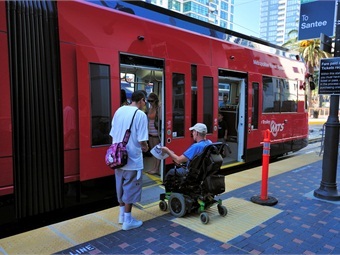 San Diego Metropolitan Transit System (MTS) riders may now face steep fines if they refuse to vacate priority seating designated for the disabled and seniors (65+) based on a new state law and a new MTS ordinance amendment approved by the MTS Board of Directors on Thursday. The new ordinance will take effect on February 13. All of these fines are subject to significant court administrative fees. In October 2015, Senate Bill 413 was signed into law giving California transit agencies the enforcement authority to establish a mandatory move policy. Senate Bill 413 allows a transit agency to enforce as an infraction the act of failing to vacate seating designated for individuals with a disability or an elderly person. All Trolley and bus vehicles have multiple areas designated for the disabled and seniors. These seats and areas are marked clearly with blue signs and are located near entry/exit points. MTS operates 95 bus routes and three Trolley lines on 53 miles of double-tracked railway. 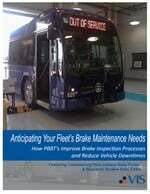 Every weekday more than 300,000 passenger trips are taken on MTS bus and Trolley services. MTS set a new record in FY 2015 with 96.7 million riders.